Graphene, the strongest material we know of, can now be made 100 times more cheaply than before, thanks to a team of scientists from the University of Glasgow, who used commercially-available super-smooth copper for it to form on. Could this be graphene’s Holy Grail we have all been eagerly waiting for? Inexpensive, mass-produced graphene could completely change the face of several industries, as well as medical devices. 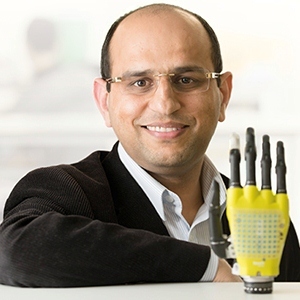 If graphene could be utilized to make artificial skin, for instance, it would help provide sensory feedback for limb prostheses, which would change patients’ lives dramatically – their artificial limbs would be nearly as dexterous as natural limbs. Graphene, a single layer of pure carbons arranged in a hexagonal lattice pattern, is so thin it is considered to be a 2-dimensional object. Team leader Dr. Ravinder Dahiya, who works at Glasgow University’s School of Engineering, and colleagues wrote about their breakthrough in the journal Scientific Reports. Graphene, an allotrope of carbon, has several extraordinary properties. It is incredibly strong – about 207 times stronger than steel, conducts electricity and heat efficiently, and is nearly transparent. Apart from being ultra-strong, it is also flexible. First isolated from graphite in 2004, graphene is a 1 atom-thick (1-dimensinal), ultra-light, flexible material. Researchers say it has several commercial possibilities, from making lightbulbs, energy storage, and applications in biological engineering, photovoltaics, electronics, aeronautical & space engineering, and filtration. Graphene’s main problem has been scale of production and cost. Not only has it been prohibitively expensive to produce, too little of it was made during each production run – that is, until now. Scientists across the globe said that if graphene production could become commercially viable, it would be adopted in a huge way by several industries. The most common way to make graphene is through CVD (chemical vapour deposition), a chemical process that converts gaseous reactants into a graphene film on a substrate (special surface). In this latest study, the scientists in Scotland used a similar process to produce high-grade, large-scale graphene across the surface of commercially available copper foils – like those used as the negative electrodes in lithium-ion batteries. Copper’s surface is super-smooth, making it a perfect material upon which graphene can form. When the scientists made optical and electrical transistors using their newly-produced graphene, their performance was significantly superior to similar material produced from previous processes. When you spray a spider with graphene you get a mega-bionic web – strong enough to catch falling aircraft, said scientists from the University of Trento, Italy, in a separate study. Dr. Dahiya and colleagues say they are keen to continue researching on graphene production, which they describe as ‘very exciting’. Scientists from Bilkent University in Turkey were also involved in this study, which was made possible thanks to funding from the Engineering and Physical Sciences Research Council (EPSRC) and the European Commissions. Citation: “Synthesis of Large Area Graphene for High Performance in Flexible Optoelectronic Devices,” Hasan Burkay Uzlu, Ravinder Dahiya, Nurbek Kakenov, Emre O. Polat, Osman Balci and Coskun Kocabas. Scientific Reports 5, Article number: 16744 (2015). Received: 16 May 2015. Accepted: 19 October 2015. Published online: 18 November 2015. DOI: 10.1038/srep16744.